Getting to the moon was significantly difficult to do in the 1960s than it is today, but still for some reason we don't go there. In the 1960s and the 1970s there was a cold war that caused enough motivation for J.F. Kennedy to pile up the country’s resources outside the NASA headquarters to get to the moon at any cost. Today, there is no cold war and economics has dominated the decisions to end the shuttle program. We need economic demand to go to the moon and we need to do this fast. 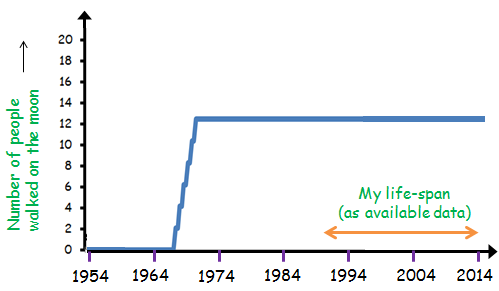 I am going to do a few blog posts about a few ideas I have thought of. Consider these as Elon Musk style open patents, from someone who is significantly more lazier than him. 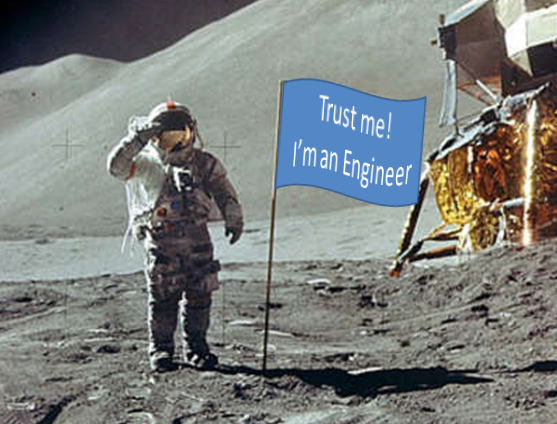 We (humanity) must get some engineers out there to solve our problems. What the world needs right now is a solution to the energy crisis. The Moon probably does not have oil, considering oil was formed from once fossilised life-forms. The Moon probably does not have coal or natural gas either for the same reason. What the moon has is a lot of barren land. What use is a lot of barren land that is visible from most of the Earth in the night time? Meanwhile, the FIFA world cup has just concluded and there has been a lot of talk in Brazil, over whether it was worth hosting it. Sports are good. They are fun, bring the world together in friendly rivalry, boost local economies, provide great conversation starters and are a welcome distraction / entertainment source to the daily life. All of this comes at a cost and it is a good idea to bring these costs down. I am sure the FIFA world cup is expensive to host, one of the most visual expenses are the stadiums. The stadiums are large and extravagant. All of them now have flood lights which turn night to day at the stadium. This obviously is expensive to do, but night matches are economically worth it. It makes the game happen at prime time, and an artificial lights game is quite a spectacle. It would be nice if we could play sport in the moon light, but unfortunately moon light is not enough. This is an engineering blog so “not enough” is not an acceptable answer. Illumination can be measured. The SI unit of the Illuminance is ‘lux’. This is what light meters measure. When a cricket umpire holds out a meter, he is measuring the light per square meter. The SI unit of light is candela, which is the amount of light provided by one candle (a definition, a bit like horse power, I am amused by the idea that there is a standard candle/horse somewhere in the world which was used as reference). For cricket ‘lights’ is offered to the batsman if the illuminance is less than a 1,000 lux. However, the FIFA regulations are tougher, demanding at least an average of 3,500 lux for an International televised game. Moon light at an average is 0.4 lux. So moon light is “not enough” by 17,500 times. Why is the moon light so low? Moon light is essentially Sunlight that is reflected by the Moon. The moon is at an average equally far away from the Sun as the Earth is, so the illumination received by the moon is the same as Earth on a sunny cloudless day, which is 1,20,000 lux. 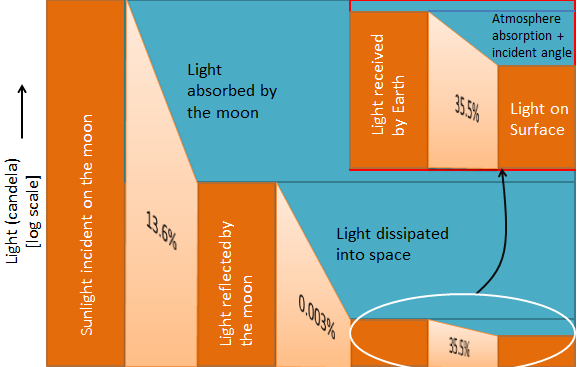 On a full moon night, the Earth receives a small fraction of light reflected by the moon, as this diagram will explain (Note the log scale). This value is ~.7 lux but the average illumination of the moon light measured on a clear night is 0.25, which means there is a 35.5% efficiency factor in there which accounts for light lost in the atmosphere (due to lack of clear skies) and averaging out of the fact that there is an angle of incidence involved both on Earth and on the moon. To have moonlight soccer, we need to start working on making this more efficient. Let’s start with the reflection co-efficient - place mirrors on the moon. We clearly need to go to the moon to do this. We have managed to produce 99.99% reflecting surfaces but let’s cover the moon by 99% reflecting mirrors. However, even if we cover all of the moon, our new ‘Disco ball’ moon will only reflect ~7.2 times more light which is still nowhere enough. Adding the 35.5% efficiency factor accounting for atmosphere loss and angle of incidences, the average illumination of the Earth at night would be 3090 lux which is enough to host a cricket match anywhere on Earth any time of the day. For a cricket field to be illuminated by 1000 lux, we need reflector area approximately 30 times smaller than a cricket field. For a FIFA match we can do with the total reflective area of 10 times smaller than a football field. They seem manageable, don’t they? These reflectors can change their angle of incidence, which means the same reflectors can light up a football match in Australia, Europe and South America on a single day. Stadiums simply rent the reflectors on a need basis and pay by the hour. Beyond sport, this gives us the power of shining light on any part of Earth whenever necessary. Imagine how useful will it be to literally light up a rescue operation if a train were to have an accident at a remote location in the middle of the night. To light up 1 km of a 6 lane highway as per this, we need only ~35 meter square of reflectors. Anyhow, I'm looking forward to sporting events scheduled as per the lunar calendar, and a cricket match being interrupted by a lunar eclipse. P.S. : I also learnt that Photometry as a subject has one of the highest (Difficulty to understand / How simple it looks) ratio that I have come across. Also, solid angles are evil. What about the lunar phase? Not all parts of the moon are illuminated all 29.54 days. We would need a series of mirrors to be placed on the moon. To be specific, we need 29 mirrors of which only one mirror each will be usable on the end crescent days. The service won't be available on new moon though. India Vs New Zealand - Second best team at the world cup? Why do couples at Marine Drive sit equally spaced from one another? Copyright © 2014 Mahek Mody. All Rights Reserved. Theme images by gaffera. Powered by Blogger.